Congratulations on coding your story. Check out this activity's add-on options. In Lightning Reaction, program your characters to react to the stormy weather. 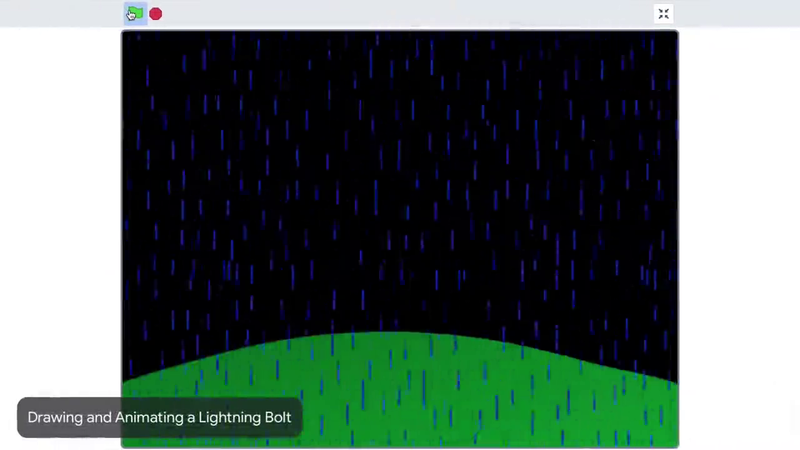 In Drawing and Animating a Lightning Bolt, draw your own lightning bolt and program it to strike. In Earthquake, add drama to your story by programming the earth to shake. Program some thunder to go with the lightning and rain in Thunder. Make your program draw a rainbow in the background of your project with Code a Rainbow. Click below to explore the add-ons that interest you. Don't stop designing and coding. Now is when you get to add your own flair to your project. Create what you want to create. In this add-on, you’ll program the characters in your story to react when the lightning strikes. In this add-on, you’ll draw and program a user-controlled lightning bolt that moves from the sky to the ground. In this add-on, you’ll program a second scene for your rainy day story. In this add-on, you’ll play thunder and rain sounds in your story. In this add-on, you’ll broadcast an earthquake to really shake up your story. Draw and program a rainbow to appear in your rainy day story!